Based largely on a study of official archives and private papers held in South Africa and the United Kingdom, this article sketches the political-strategic landscape on which the armed forces of South Africa operated between 1900 and 1940 and analyses the organisational and extraneous factors that affected their functioning and influenced their preparation during peacetime. It explores the doctrinal framework, including an assessment of the services' commitment to the problem of doctrine and of their rigour in drawing, learning and implementing the so-called "lessons" of the First World War. The South African reaction to the 'total war' experience of industrialised warfare is discussed and the attempts, apparently always feeble, by the South African state to adapt to the changing face of modern warfare are explained. It comes with little surprise that the Union Defence Force, after the experiences of the Western Front (1916-1918), was still so unprepared for European warfare in 1941. Hierdiedie artikel is gebaseer op primêre navorsing uit amptelike argiewe en privaat versamelings in beide die Verenigde Koninkryk en Suid-Afrika, en skets die polities-strategiese landskap waarin die Suid Afrikaanse verdedigingsmagte ontplooi het tussen 1900 en 1940. Verder bied die artikel 'n analise van die samestelling van die Unieverdedigingsmag, hul unieke organisasie en ander faktore wat 'n uitwerking gehad het op die verdedigingsmag se voorbereiding gedurende vredestydperke. Die sogenaamde 'lesse' wat geleer is tydensd Suid-Afrika se deelname aan die Eerste Wêreldoorlog, sowel as die gewilligheid om dié lesse in amptelike doktrine te implementeer , word ondersoek. Die Suid-Afrikaanse begrip van 'totale oorlogvoering', en Suid-Afrika se eerste ervaring van oorlogvoering op 'n industriële skaal word ook bespreek. Die halfhartige manier waarop die Suid-Afrikaanse staat aangepas het by moderne oorlogvoering gedurende dié typerk word ook bespreek. Dus is dit geen wonder dat die Unieverdedigingsmag gedurende 1941, veral na die ervaringe op die Westelike Front (1916-1918), steeds grootendeels onvoorbereid was vir Europese oorlogvoering nie. This paper aims to do three things essentially.5 It will attempt firstly, to sketch, in broad brush strokes the political-strategic framework within which the Union Defence Force and its predecessors had to function between 1900 and 1940. Secondly, the organisational and extraneous factors that affected the functioning and influenced the preparations of the Union Defence Forces will be set out. Thirdly, the doctrinal framework, including an assessment of the services' commitment to the problem of doctrine and of their rigour in drawing, learning and implementing the so-called "lessons" of the First World War, will be explored. It will therefore address the South African reaction to the brutality and high costs of industrialised warfare and explain the attempts, apparently always feeble, by the South African state to adapt to the changing face of modern warfare. It will also address the matter of force design and attempt to answer the question of why the Union Defence Force, after the experience at Delville Wood (July 1916) especially, was still so unprepared for European warfare in 1941. Plans were drawn up by the imperial authorities and the colonial administrations in the four British colonies in South Africa to counter the eventualities; they were coded alphabetically, Plan Z being a lightning strike against the Portuguese in Lourenco Marques.7 Yet, except for minor operations within the borders of British South Africa,8 the imperial defence authorities knew they did not have sufficient troops and so, from 1902 until 1912, they turned their attention to the creation of a manpower mobilisation system that reconciled projected wartime force estimates with the often whimsical, seldom extravagant notions of British imperial and South African politicians, administrators and officials. The answer was found momentarily in finding a balance between the declining number of imperial troops and the fostering of volunteer organisations in the colonies. A fundamental overhauling of military policy, it was hoped, would create a geography of loyalism on the Highveld.9 British settlers, encouraged by rumoured native risings, rushed to the colours. The Boers, defeated in 1902 and disarmed briefly, were courted and encouraged and many enlisted, although they joined the British-style volunteer regiments for reasons of rural insecurity rather than any feeling of loyalty to the British crown. Although momentarily mollified by the promise of better rural security, Afrikaner republicans vacated the volunteer regiments from 1907 and enlisted in the resurrected commandos. South Africa's military forces, at the start of our period colonial and varied, existed between 1900 and 1939 on a political landscape that was apt to change rapidly and dramatically. Several, interrelated factors shaped this environment. First and foremost, was the military geography of South Africa and her relatively isolated position at the southern end of the African continent, seemingly distant from the discord of Europe and Asia. Moreover, South Africans presumed that in the event of war, the enemy would be distant from the bases of his supply and that the Royal Navy, with a base at Simonstown until 1955, would counter any seaborne threat, while the British Army command, in Cape Town until 1921, would assist local forces in repelling a land-based enemy that would, in any case, have to cross difficult country, a vast desert in the west and malarial jungle in the east. South Africa had at this point in Britain and her Empire not simply an ally, but a professed protector that was then the world superpower. Second, South Africa had her own fault-lines, which were immediately susceptible to the grinding of geopolitical fault-lines in Europe.14 The presence of a German colonial army in Namibia and warmth between them and a significant number of Afrikaners, cast this into dramatic relief. There was an almost natural gravitation of Afrikaners, particularly the nationalists of the former republics, to these Germans, who were more alike in stock and had assisted the Boer republics in their war against the British Empire. This had been a total war, one that cast long, historical shadows, and, although the military conflict ended in 1902, for many Afrikaners, brought unwillingly into the British fold, their struggle against "the English" ended only in 1961 when South Africa withdrew from the British Commonwealth of Nations.15 In 1914, Britain's claim to protect small nations seemed dubious to many South Africans. Moreover, from 1902, the likelihood of an international war between the great powers was increasing. Imperial rivalries around the world, particularly in Africa and the competition for resources necessary to fuel European industry and manufacture the weapons of industrialised warfare, threatened to make the next war both global and expensive. The shifting of European tectonic plates impacted on South Africa, despite her relative geographic isolation and apparent strategic safety. But the creation of the Union Defence Forces (UDF) was no easy matter. Jan Smuts, an eager defence minister, had to move cautiously to avoid any "appearance of compulsion or militarism on the European model".20 M.T. Steyn, the former president of the Orange Free State, for example, remained concerned that the new force, and the school cadet system especially, would create a spirit of militarism and that the lines between the imperial forces and the Union forces would be blurred. The Afrikaners were not alone. John X. Merriman, Cape politician and elder statesman, was concerned that South Africa "not be led into militarism and to any unwise pledges of sharing in the quarrels in [the] inciting [of] which we have not been consulted".21 His vision for a small force, having good organisation and excellent supply, but with "not too much discipline", was countered by the Unionists. The Unionists demanded a force not only sufficient for internal defence, but able also, in concert possibly with British forces, to repel the attack of a European enemy possibly elsewhere in British Africa. Opposing his own party, Smuts introduced the South Africa defence bill in February 1912. An avalanche of criticism and high levels of discontent in the country districts of particularly the Transvaal followed.22 There remained, as Hugh Wyndham noted, "a great deal of suspicion of its provisions amongst the old fashioned Boer population" and mostly regarding the principle of compulsory training.23 Petitions were considered, the Military Code and Rules of Procedure as provisionally adopted from the British Army Act were consulted, and in the face of severe opposition the bill was adopted in April 1912.24 As a party, only the Unionists were satisfied, for the bill stressed the importance of defence as an imperial matter.25 However, this legislation contained the seed of its own near destruction. "South Africa", as used in the Act, was a geographic expression, left purposely undefined by Smuts, although he had assured the governor-general that 'it would surely cover any part of the continent of Africa south of the equator".26 However inadequate the UDF was, it represented a fundamental change in South African military policy. The Defence Act recognised a dependence on the Royal Navy to protect South Africa from foreign invasion and there were now coastal defences backed by military forces on the interior. But few thought the UDF would undertake military tasks beyond "South Africa", and so the UDF remained essentially a colonial constabulary and coast-defence organisation with few sharing Smuts' vision for a more balanced, modern force, capable of engaging a modern enemy. Like the Union of South Africa, the UDF was a compromise between the determination of English-speakers to maintain the "British connection" and the desire of Afrikaner nationalists for a restoration of Boer political and military traditions. It was self-evident - despite the appeals of Olive Schreiner and others -that the new South African state founded in 1910 was to be a militaristic if not well armed society. The Union Defence Forces was thought by politicians across party lines to be both natural and inevitable. But it was less evident how exactly members of four disparate forces, representing at least three military traditions, and speaking and protecting two languages, were to combine into the defence structures. In the face of severe Afrikaner opposition, the Union Defence Forces (UDF) were established with effect from 1 July 1912. The Union Defence Forces, which drew in structures from the four former colonies29, was itself a combination of six forces - the SA Permanent Force (SAPF), the Active Citizen Force (ACF), the Coast Garrison Force (CGF), the Rifle Associations (or resurrected Commandos), the Royal Naval Volunteer Reserve (RNVR), and the Cadet Corps. The UDF, in terms of the Defence Act, was created for the defence of "South Africa" and it encompassed the traditional cornerstones of South African military policy, namely, citizen soldiers, a small permanent force, a small local division of the Royal Naval Volunteer Reserve, which was stationed at the major ports only, and very thinly-spread coastal fortifications. However, several factors affected the Union Defence Forces and undermined its standing as a reliable, well-equipped, and deployable defence force. Beyers, the commandant general of the Citizen Force, was cut from different cloth, which introduces a fourth matter, that of the military factions created before 1912 in the struggle for military power and the rush on the available posts in the new structures. Beyers and several other high-ranking officers provided organisationally for their clients and political followers; Beyers, when head of the Citizen Force, even emptying the citizen regiments of their more "British" officers.38 This, as Charles Leonard complained, worked towards "permanent alienation instead of reconciliation"39 and affected the unity of the Union Defence Forces materially. Wyndham, pushed out of the Citizen Force in 1912, had noted somewhat prophetically two years earlier that Beyers was "a very violent Boer", capable of making "very racial speeches" and that if he were made "Minister of Defence, or Commandant General, [this] would lead to the dismemberment of any defence force that we may possess at present or in the future".40 The establishment of organisational fiefdoms stunted development and the UDF failed to employ officers with the appropriate military training and education. And then, to complicate the complexity of this situation even further, there was the presence of two British commands in South Africa, which although a military necessity, was the cause of political mischief of a two-way flow, pressing Pretoria to "demonstrate independence". The strategic framework of the period was complex and fraught with difficulties, which were at once political, cultural, economic and organisational. There was, of course, interplay between individual leaders and their past experiences and their approach to military innovation, and the cultural climate of the Union's new military structures. Military leaders and their political masters had no consensus on who the potential enemies were, although the services viewed the defence of South Africa (possibly a geographic and not solely a political term) against a possible landward onslaught as their overall strategic mission. The services were always cash-strapped and competed, certainly during interwar years, for the shrinking pool of resources. As a result, the UDF enjoyed only difficult access to technological resources and there was seldom congruence between political objectives and force capabilities. And then, the experiences of the 1914-18 war shaped the strategic environment and the preparations for future conflict considerably. Republican Afrikaners had longed for this in 1900. Now, fourteen years later, this had seemingly happened and there was new hope. The Afrikaner nationalist saw no reason whatever to help Britain. They might, as Steyn was suggesting, rather seize the moment presented providentially as an occasion for a small people to assert their claim for independence, even militarily if necessary. Botha, perhaps naively, had hoped to unite the country behind the war effort, and so strengthen longer term bonds. This was, as Francey Malan noted, "wonderful politics" and Botha succeeded to a surprising degree in quietening the voice of radical labour and nationalistic Africans. However, as Malan predicted, by committing South Africa to the war, Botha ran "the danger of losing the sentiment of the [Afrikaner] people".49 The war and the questions it opened raised African expectations and fuelled Afrikaner nationalism. Botha therefore battled to achieve and then maintain consensus in his cabinet. Faced with potential defections and the growing rift in Afrikanerdom, his first wartime ministry was unstable and his second ministry, formed after the October 1915 election, could only govern with Unionist support, though not in formal coalition. For the allied powers, the ostensible victors, victory was bittersweet. For South Africa, this was little different. Although the country emerged physically unscathed, the price tag, in money and sacrifice, was high.56 The numbers of South African casualties were relatively small. 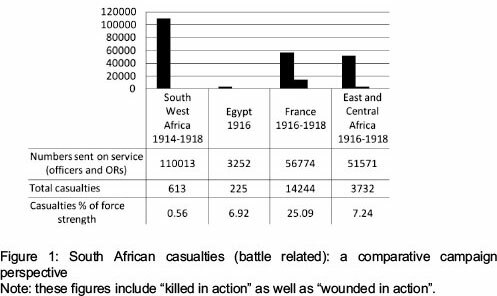 Battlefield casualties (killed and wounded in action) were particularly low for the African campaigns, numbering 0.56 percent of force strength in German South West Africa; 6.92 in Egypt and 7.24 in German East Africa. This rose to 25.09 percent for the campaign on the Western Front (Figure 1). But this was also low when compared with the other dominions. The total killed during the war (1914-1918) was 9 percent of those serving abroad, the next lowest was Canada at 12 percent. 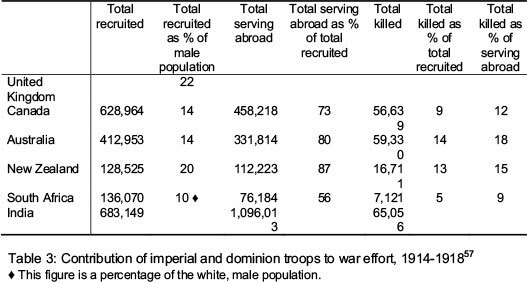 Most of the 7 121 South African killed during the war had died on the Western Front (Table 3). For South Africa, a country accustomed to limited wars and low own-force casualties, these losses were unacceptable. Furthermore, the war, together with the rebellion and rumour of rebellion, had come at a political cost, increasing as it did popular suspicion of government, leaders, and institutions like the military. It discredited Botha and Smuts, the wartime ministers, and, although temporarily aligning South Africa with the allied powers, estranged Smuts and those of broader vision from the mass of Afrikaners. Yet, although it was "no use girding against the poor minnows we have got", Mrs Wyndham was convinced, as many South Africans were, that "there [were] things even a minnow might avoid".59 The South African leadership, although praised in Britain for their stance, was at times, for both the British sector in South Africa as well as the Afrikaner right, an object for amusement and of scorn. Some soldiers derided the politicians for their apparent willingness "to fight to the last drop of blood of the soldiers at the front".60 They, the politicians, were the true enemy; the soldiers, collectively, their victims. They were innocent and their sacrifice almost Christ-like. Emily Hobhouse blamed the politicians, "who make troubles", for sending the troops in to be killed.61 N.W. Nichol, vocalising a popular sentiment, reckoned that "there is no doubt the politicians ought to get it in the neck, it's an awful shame that the soldiers should be the only ones to suffer".62 They had been exposed to the brutality of warfare in Europe supposedly without proper training. There was a notion that colonial volunteers ought not to have been thrown into the line against German militarism. Geography and post-Versailles politics had combined to give South Africa reasonably safe and defensible borders. The 1922 Smuts-Churchill agreement left the Royal Navy responsible for the protection of the coastline and, with Simonstown now recognised as a British naval base, all of the reasonable risks of war seemed effectively covered. Germany had been driven out of Africa, German South West was in South African hands, and Tanganyika had gone to Britain. There was now no apparent danger of attack overland and, in any case, the overland routes were limited, the potential European enemies geographically distant, and African opponents at a technological disadvantage. The Hertzog government, which came to power in coalition with Labour in 1924, could as a result settle into an easy military economy. Nationalist politicians followed this line from the start and, after their electoral success in 1924, implemented increasingly a policy of neutrality. There were several constraints, however. For one, there was no common vision on who constituted the most likely enemy. The post-war threat assessment identified several potential enemies and possible theatres of operations; interestingly, the threat perceptions had changed little since the turn of the century. There was theoretically, after Germany's defeat, always a non-African power able to project force inter-continentally. During the 1920s this was France. During the 1930s Italy and Germany were assessed the greater threat. Nationalist politicians, and their supporters within the military, reckoned Britain a threat, either as a possible foe or as the mechanism through which South Africa would be dragged into another war. There was also the threat of landward invasion from continental Africa, which might take the form of a colonial power with imperial objectives or the possibility of an African revolt against colonial rule sweeping south, possibly a mutiny by the Force Publique of the Belgian Congo.72 Three assumptions underlay nationalist policy: there would be time for mobilisation; the war would be mobile and in the African bush north of the border and South African cities and towns would be safe from air attack.73 The third threat, omnipresent since 1906, was an internal uprising by African nationalists or syndicalised labour within South Africa itself. For the first contingency there was the Royal Navy. But for the second and particularly the third contingency, South Africa, they argued, was particularly vulnerable. Various measures were taken to buttress the defence force, which had been stripped out for reasons of economic efficiency by the nationalist governments, and counter strategies to meet each of the three contingencies were designed and, by degree, implemented. These measures, sometimes meaningful, but often feeble, included increased professionalism in the military; appointments based upon military merit rather than political affiliation; the search for alliances; and re-equipment. With time three broad principles emerged. Firstly, the zone of deployment for the UDF was Africa and the UDF would only be deployed for the immediate defence of South Africa, where it would enjoy the advantages of technological asymmetry. Here was a further assumption: that the UDF would never again have to be deployed to Europe.74 Secondly, the UDF would be a small force, well-equipped for its purpose. There would be an emphasis on mounted infantry and a small air force, but little room for mechanisation as the lack of infrastructure in Africa pointed to little use for it. Thirdly, the UDF would nonetheless be sufficiently lethal to deal with internal conflict, sufficiently potent not to run the risk of many own-force casualties. This is seen at Bulhoek, the Bondelswarts uprising, the Rand revolt of 1922, and the Ipumbu uprising of 1931, where the UDF, deployed in three of these cases to conduct punitive operations, had great psychological advantage. The lack of common vision regarding the threat perception, created substantial differences in the other strategic calculations. These considerations, as Millett has shown, regard the "anticipated theatres of operations, the immediacy in distance and time from the possible outbreak of war, the balance between deterring war or simply preparing to fight it, the likely length of a potential conflict, the role of allies", in South Africa's case, the role of the United Kingdom as primary "ally" and, of course, questions of force design and "the anticipated requirement for joint air-sea-land operations".76 Broadly-speaking, Africa south of the equator was considered by the government to be the zone of deployment for a small force that had to be sufficiently-lethal, psychologically-overwhelming, and well-equipped. As far as Collyer was concerned European textbooks were irrelevant in Africa and he set about producing standard texts for warfare in Africa, deducing the "lessons" in the nineteenth-century utilitarian, didactic fashion, neatly set-out for the instruction of officers at the South African Military College.83 Although, many of his "lessons" were misinformed, they provide a rare insight into inter-war South African military thinking. Collyer, thought by some to be "the Liddell-Hart of South Africa",84 pointed out and quite rightly that South Africa had not been prepared for war in 1914 and his first call was for the systematic collection and updating of information in Sub-Saharan Africa and "the teaching of experience", emphasising both the importance of military history and the collection of accurate military information. Foreknowledge would lessen the difficulty in gaining strategic surprise, shorten campaigning in tropical Africa, and so limit casualties. However, Collyer, a mounted infantryman with fifty years of service in Africa, was clearly not a man for modern devices. He highlighted the problems of air power rather than possibilities85 and discounted the immediate value of mechanised transport in Africa, only mounted troops could be relied upon, and so provided unwittingly a theoretical basis for the "bush cart" policy of Oswald Pirow, who became defence minister in 1933.86 The type of operations undertaken by South Africa in East Africa in 1940 and North Africa in 1941 had simply not been contemplated. Increasingly attention was focused and resources spent on the development of air power and land and naval matters were increasingly neglected. A redistribution of funds and opportunities from the army and naval service to the air force was the pattern for the remainder of the interwar period with several defence acquisitions contracted with Germany. Doctrinal development did not keep pace with technological developments and the mechanisation of ground forces and the application of new technology contrasted sharply with developments in Europe. Although South Africa had the industrial capacity for the development of armour and mechanised forces, arguments based upon the nature of potential enemy forces, poor infrastructure and terrain inaccessibility combined with government policy and financial stringency resulted in little being done. Southern Africa, the focus of South African defence policy, was also thought to be unfavourable for mechanised warfare. Inadequate roads and multifarious geographic features concentrated energy on the development of the air arm for operations in Africa and a system of coastal defences to repel a sea assault, as well as a mix of British and Boer-type infantry supported by field artillery. As a result, an expeditionary force had to be prepared from scratch after September 1939 and the first South Africans to serve in the Second World War only left the country in July 1940. Yet the close relationship between the projected role of the Union Defence Force and the low priority given to force maintenance and weapons acquisition has been perceived by few writers. South Africa experienced three total wars during the first half of the twentieth century, which makes her unique. Moreover, through this sequence - the Second Anglo-Boer War, the First World War and the Second World War - the totality reduced progressively and it was a limited war, a flashpoint of the Cold War, fought at the century's end that changed the country irrevocably. Nonetheless, the period 1900-1940 witnessed important developments in South African military policy. The first of these was structural, involving the departure of British armed forces and a decisive shift to a South African monopoly of military force within her borders and the consolidation of her apparatus in permanent land, air, and sea forces, along with the bureaucratic infrastructure necessary to sustain them. This changed both the nature of the defence structure and of the conduct of war on the subcontinent itself. Inter-state conflict became more distant, while internal conflict became more prevalent, certainly during the middle of the period. The Union Defence Force faced outwards against external dangers to the colonial state, while internal threats were met by a variety of more peaceful tactics, which were well-developed by the second decade of the twentieth century. The political debate for much of this period focused on the distribution of the burdens of defence, both across an increasingly-moribund British Empire and within the Union of South Africa, where "neutrality" was a rallying call for appeasers and pacifists, ever more militant Afrikaner nationalists and indeed anybody who bore a grudge against "the British". Such extraneous influences together with a mix of institutional factors brought military and intellectual regression between 1918 and 1939, although indeed the UDF through this period had the appearance of greater professionalism and assumed an internal organisation and forms of behaviour typical of Western counterparts. Yet, like the rest of the British Commonwealth, much of the doctrine and tactical innovation had not kept pace with technological developments. Training and training facilities were inadequate and there was a shortage of uniforms and equipment. The army, despite constant undermining by the Afrikaner nationalist press, was still an honoured and respectable profession. Promising commanders studied tactics and strategy at the SA Military School, and the cream went on to British institutions, in some cases not to return. This continued until the final fall of Smuts in 1948 and the establishment of more specialised institutions of military education and training in South Africa. By 1945 the UDF displayed state-of-the-art tactics and operational originality. They had moved from an emphasis on mounted infantry in 1912 to the combined operations so characteristic of the Second World War. 3. National Archives of South Africa, Pretoria (hereafter NASAP): A.1, Field Marshal J.C. Smuts Papers, vol. 132, "Statement of the Local Military Position on 7 September 1939 and steps taken thereafter". 5 This framework is suggested by Murray and Millett, Military Innovation in the Interwar Period, pp 1-5. 6. Military Archives, SANDF Documentation Centre, Pretoria: Diverse, Box 15, file 199, Colonial Defence Committee Memoranda on General Defence Matters, Bourne to Smuts, 8 September 1910; and Smuts to Bourne, 20 September 1910. 7. SANDF Documentation Centre, Pretoria: Archives of the Secretary for Defence (hereafter DC), Box 356, DC40057, Intelligence Section Secret report from Major J.G.W. Leipoldt to the Adjutant General, 22 December 1917. See also SADF Documentation Centre: Union War Histories, Box 339, Miss Pope-Hennessy, "Z Plan Narrative", 1949. 8. These were the colonies of the Cape of Good Hope and of Natal as well as the two former Boer republics that had been incorporated into the British Empire in 1900 as the Transvaal Colony and the Orange River Colony. 11. H.T. Lukin, Savage Warfare: Hints on Tactics to be Adopted and Precautions to be Taken (Cape Times Ltd, Cape Town, 1906). [ Links ] See also National Archives of South Africa, Cape Town (hereafter NASAC): CO 8310, file X5114, "Savage Warfare"; P. Truter to Col Lukin, 10 May 1906. 12. West Sussex Record Office (hereafter WSRO): Petworth House Archives (hereafter PHA), uncatalogued letters of H.A. Wyndham, Lt Col Hon Hugh Wyndham to Lady Leconfield, 27 August 1906. 16. Hagley Hall Archives (hereafter HHA): 2/34/13, Maud Wyndham to Lord Cobham, 19 February 1912. 17. University of Cape Town Libraries, Archives and Manuscripts (hereafter UCT): BC294, Duncan Collection, D1.33.2, Olive Schreiner to Patrick Duncan, 27 June 1912. 19. These conferences were convened, in Pretoria, Durban, and Johannesburg, and were followed by the Imperial Conferences of 1909 and 1911. Debatten van de Volksraad, 21 February 1911, cols 1263-66. See also, War Office Documents, A1380, South African Defence. 20. Rhodes House, Oxford (hereafter RHO): Sir Herbert James Stanley Papers, MSS Afr s.1250, Herbert Stanley to Lord Gladstone, 7 August 1910. Kent Fedorowich is thanked for this reference. 21. J.X. Merriman to M.T. Steyn, 16 January 1911, in A.H. Marais (ed. ), Politieke Briewe, II: 1911-1912 (Tafelberg, Bloemfontein, 1973), p 5. 22. NASAP: Beyers Collection, col 1, ff. 45-47, M.T. Steyn to C.F. Beyers, 16 February 1912. See also the two petitions, Memorial of the Women of Nooitgedacht, undated (ff.104-107), and Memorial of the Women of Randjesfontein, undated (ff.108-110). 23. WSRO: PHA, Hugh Wyndham to Lady Leconfield, 21 February and 27 February 1912. 24. Union of South Africa, Parliament, Select Committee Report: S.C.7-1912. On South African Defence Bill, see report, J.C. Smuts, 16 April 1912. 25. RHO: Feetham Papers, Box 3, file 1, folio 134, Richard Feetham to his mother, 19 April 1912. 26. Smuts did not consider the term "South Africa" in any way limited by the Act of Union. SANDF Documentation Centre, Pretoria: DC, Box 47, file 1063, South African Defence Bill, Smuts to Lord Gladstone, 16 November 1911. 27. Field Marshal Lord Methuen and his chief of staff, Brigadier General George Aston, were also consulted and, at Smuts' request, both men remained in South Africa until the passage of the bill through the South African parliament. SANDF Documentation Centre, Pretoria: DC, Box 47, file 1063, South Africa Defence Bill. 28. William Cullen Library, University of the Witwatersrand (hereafter Wits): Archives of the Church of the Province of South Africa, AB186, Archbishop Carter Letters, William Carter to Algernon Lawley, 3 August 1919, The term "backveld" was used by the English South Africans to refer to "the rolling countryside of the two old republics". See A.G. Barlow, That We May Tread Safely (Tafelberg, Cape Town, 1960), p 66. [ Links ] Barlow's definition, however, does not suggest the pejorative meaning that the term conveyed. 29. These were the Cape Colonial Forces, the Transvaal Volunteers and the Natal Militia, as well some former members of the South African Constabulary, a paramilitary police force for the Transvaal and Orange River colonies. 31. NASAP, General C.F. Beyers Collection, Vol. 1, Beyers to Sir John French, 21 July 1913 ("the melting pot"). There are also numerous references to instances of nepotism and "connection" support in J. Kemp to Beyers, 5 April 1909; M.T. Steyn to Beyers, 30 September 1913; Smuts to Beyers, 27 February 1914; "Maurits" to Beyers, 8 June 1914 (all in NASAP, Beyers Collection, vol. 1). See also NASAP, Col M. du Toit Collection, W.77.1, in the correspondence between Colonel du Toit and former president M.T. Steyn, 1912. 33. Wyndham, "Some Aspects of South African Defence", p 651. 34. Debatten van de Volksraad, 7 March 1912, col 736; and Union of South Africa, Parliament, Select Committee Report: S.C.7-1912. On South Africa Defence Bill, p ii. 35. NASAP: General C.F. Beyers Collection, Vol 1, J.C. Smuts to C.F. Beyers, 9 May 1914, and "Maurits" to C.F. Beyers, 8 June 1914. 36. Van der Waag, "Smuts' Generals", p 51. 38. NASAP: General C.F. Beyers Collection, Vol 1, J. Kemp to C.F. Beyers, 5 April 1909, and M.T. Steyn to C.F. Beyers, 16 February 1912; NASAP: Col M. du Toit Collection, C.F. Beyers to M. du Toit, 23 December 1912. See also, Kemp, Die Pad van die Veroweraar, p 109. 39. NASAP: Charles Leonard Papers, Charles Leonard to David Graaff, 17 February 1903. 40. WSRO: PHA, Hugh Wyndham to Lady Leconfield, 2 November 1910. 41. UCT: BC81 Papers of Sir W.H. Clark, Ca5, Sir William Clark to Sir Edward Harding, 8 March 1937. 42. SANDF Documentation Centre, Pretoria: DC, Box 1142, file DCDB 2394/7, Speech by General Cavendish at a meeting of the St. John's Ambulance on 2 November 1917. See also suggested recall of Brigadier General Cavendish G.O.C. South African Military Command and appointment of General Martyn. 47. P.F. van der Schyff, "Die Unioniste Party in die Suid-Afrikaanse Politiek, 1910-1921", M.A. dissertation, PU for CHE, 1964), p 72. 48. M.T. Steyn to J.C. Smuts, 31 July 1914, in W.K. Hancock and J. van der Poel (eds), Selections from the Smuts Papers, Vol 3: June 1910-November 1918 (Cambridge University Press, Cambridge, 1966), p 184. 49. NASAC: A583, F.S. Malan Collection, Volume 22, Diary of F.S. Malan, 9 August 1914. See also F.A. Mouton, Prophet without Honour, F.S. Malan: Afrikaner, South African and Cape Liberal (Protea Book House, Pretoria, 2011), chapter 7. 50. J. Buchan, The History of the South African Forces in France (Battery Press, Nashville, 1992), p 13. [ Links ] See also Emily Hobhouse to J.C. Smuts, 8 August 1914, in Hancock and Van der Poel (eds), Smuts Papers, Volume 3, p 185. 51. Buchan, The History of the South African Forces in France, p 13. 52. The South African Military Command closed with effect from 1 December 1921. SANDF Documentation Centre, Pretoria: DC, Box 886, file Q.23892, Transfer South African Military Command to Union Defence, Secretary for Defence to the Headquarters, SA Military Command, 28 September 1921. 53. WSRO: PHA, Hugh Wyndham to Lady Leconfield, 13 August 1914. 54. Adapted from Official Yearbook of the Union of South Africa 1922 (Government Printer, Pretoria, 1922), p 399. 58. WSRO: PHA, Maud Wyndham to Lady Leconfield, 8 December 1915. Mrs Wyndham, incidentally, was born a Lyttelton of Hagley. She was descended from the core of the governing families of eighteenth- and nineteenth-century Britain and her ancestors included both Chatham and Marlborough. Of this she had also been aware. 59. WSRO: PHA, Maud Wyndham to Lady Leconfield, 8 December 1915. 60. UCT: BC643 Joyce Newton-Thompson Collection, B1.53, Lt Cyril Newton-Thompson to Joyce Nettelfold, 21 July 1916. 61. Emily Hobhouse to J.C. Smuts, 8 August 1914, in Hancock and Van der Poel (eds), Smuts Papers, Volume 3, p 186. This idea still has currency in South Africa. See, for example, G. Mills, "Canon Fodder for Man's First Mechanised Mass Murder", The Sunday Independent, 13 February 2005, p 17: "They were brave, [ Links ] but the war itself was a costly folly and the political leaders who caused it were callous and inept." 62. UCT: BC477 Purland Family Collection, N.W. Nichol to Capt T. Purland, 1 August 1917. 65. The repercussions of industrialised warfare have been addressed by A.R. Millett and W. Murray, Military Effectiveness, Volume 1: The First World War (CUP, Cambridge, 2010); [ Links ] T. Travers, The Killing Ground: The British Army, the Western Front, and the Emergence of Modern Warfare, 1900-1918 (Allen & Unwin, London, 1987) and How the War Was Won: Command and Technology in the British Army on the Western Front, [ Links ] 1917-1918 (Routledge, London, 1992); [ Links ] A. Ashworth, Trench Warfare, 1914-1918: The Live and Let Live System (Macmillan, London, 1980); [ Links ] and others. 66. Smuts to Wolstenholme, 29 November 1915, in Hancock and van der Poel (eds), Smuts Papers, Volume 3, pp 324-325. 67. Buchan, The History of the South African Forces in France, p 260. 69. See, for example, SANAC: A608 Fremantle Collection, Volume 14, Fremantle to Hertzog, 12 November 1923. 70. "Dr Malan en die Dardanelle", Volkstem, 2 September 1922. Translated from the original Afrikaans: "Die Dardanelle is nie 'n druppel van ons bloed of 'n sjïeling van ons geld wêrd nie, en Suid-Afrika behoort hom neutral te verklaar. 71. "Geen Man en Geen Pennie; Ons Leier oor die Wereld-krises", Ons Vaderland, 22 September, 1922. 72. Information extracted from War Office, Admiralty and RAF files by Capt. F.H. Theron in September 1929. SANDF Documentation Centre, Pretoria: DCS, Box 3, file SP 9, Capt Theron's attachment to War Office report on "Belgian Military Forces in Congo: Extract from Report of Colonial Ministry". 73. D. Cowie, "Union of South Africa", Journal of the Royal United Service Institution, 84, 1939, pp 262-263. 74. After 1918, many South African political parties embraced the notion that South Africa should not become entangled in schemes for imperial defence; here Smuts and his shrinking support base, including the Unionists after 1921, were the exception. After the promulgation of the Statute of Westminster (1931) the NP in particular was adamant that South Africa was in no way bound to enter any war. Nationalists contended that a consistent policy of neutrality was South Africa's first line of defence against foreign aggression. See, J.S. Gericke Library, University of Stellenbosch: Dr D.F. Malan Collection 1/1/2355, "Die Agtergrond van ons Verdedigingsbeleid". 78. SANDF Documentation Centre, Pretoria: WO1DA, Box 5, War Diary, South African Infantry Brigade Headquarters, Brig. Gen. H.T. Lukin to Maj. Gen. W. Furse, 3 August 1916, This has been quoted at length by Ian Uys in his Rollcall; The Delville Wood Story (Uys Publishers, Johannesburg, 1991). 79. In 1921 "UDF Infantry Training, Part I (Drill) and Part II (Field Operations)"; "UDF Field Artillery Training"; "UDF Musketry Regulations"; a revision of "Mounted Riflemen Training"; "Tactical Notes for Officers"; and "Notes on Field Sanitation", were in the process of preparation. 80. J.A.I. Agar-Hamilton, "The Union of South Africa War Histories", in R. Higham (ed. ), Official Histories; Essays and Bibliographies from around the World (Greenwood, Westport, 1970), p 443. 81. Collyer began his military career with the Cape Mounted Riflemen and saw action in the Second Anglo-Boer War as well as the two African campaigns of the First World War. He retired as Chief of the General Staff in 1920, when he embarked upon his histories of the South West and East African campaigns, which received official sanction in 1936. See I. van der Waag, "Contested Histories: Official History and the South African Military in the 20th Century", in J. Grey (ed. ), The Last Word? Essays on Official History in the United States and British Commonwealth (Praeger, Westport, 2003), pp 27-52. 83. Preface in Collyer, The South Africans with General Smuts in German East Africa. See also D. Visser, British Influence on Military Training and Education in South Africa: The Case of the South African Military Academy and its Predecessors", South African Historical Journal, 46, May 2002, pp 63-82. 88. Abridged Annual Report of the Department of Defence for the Year ended 30 June 1925 (Government Printer, Pretoria, 1926), paragraph 10. 89. SANDF Documentation Centre, Pretoria: DC, Box 559, file DC 6/57205 O.C. Field Force Roberts Heights. Sadly very few documents dealing with the South African Field Force are to be found at the South African Military Archives in Pretoria because most of the records generated by the Commander of the S.A. Field Force were destroyed following an archival appraisal in 1933. See SANDF Documentation Centre, Pretoria: DC, Box 1910, file DC 251/6, Records Defence Department Destruction of Valueless Records. 90. Abridged Annual Report of the Department of Defence for the Year ended 30 June 1926 (Government Printer, Pretoria 1927), pp 12-17. 91. SANDF Documentation Centre, Pretoria: DC, Box 1026, file DF 573/9, Rehoboth Disturbances 1925, Circular DF 9/573, 21 April 1925. 92. This view was certainly held by the Admiralty at the time. See TNA: DO 35/186B/11, Report by Major A.N. Williams, R.M., former Royal Navy intelligence officer stationed in Cape Town, 17 April 1934. 93. TNA: DO 119/1052, Memorandum on South African Coast Defences, attached to Evans to High Commissioner, 10 September 1935. These opinions, while seemingly unkind, were widespread within British circles and were directed broadly at South African officialdom. See also UCT: BC81, Papers of Sir W.H. Clark, Ca1, Sir William Clark to Sir Edward Harding, 14 January 1935. 94. SANDF Documentation Centre, Pretoria, Annual Reports of the Department of Defence, 1925-1939. 95. TNA: DO 119/1052, Memorandum on South African Coast Defences, attached to Evans to High Commissioner, 10 September 1935. 96. Wits: Archbishop Carter Papers, William Carter to Algernon Lawley, 18 December 1914. Similar views filled the press: See SANDF Documentation Centre, Pretoria: DC, Box 573, file D.9199, European Crisis General, Volume 7, Editor of Transvaal Leader to Smuts, 7 January 1915. 97. NASAP: A1 Smuts Papers, Volume 132, Capt. D.J. Louw to Lt. Col. C.L. Engelbrecht, 1 November 1939 p 11. 98. NASAP: A1 Smuts Papers, Volume 132, Col B.W. Thwaites, Director of Intelligence to Military Secretary to the Prime Minister, 14 November 1939 (f.15). 99. E.P. Hartshorn, Avenge Tobruk (Purnell, Johannesburg, 1960). 100. NASAP: A1 Smuts Papers, Volume 132. Statement of the Local Military Position on 7 September 1939 and steps taken thereafter. 101. Abridged Annual Report of the Department of Defence for the Year ended 30 June 1921 (Government Printer, Pretoria, 1922), p 4. 104. Birkby, Uncle George, pp 71-72, 87-91. On military education in South Africa during this period see the insightful piece by Visser, "British Influence on Military Training and Education in South Africa", pp 63-82. 105. TNA: DO 35/1008/7, WG 429/13, as quoted in Clutterbuck to Stephenson, 29 September 1939. 106. Hans van Rensburg led the Ossewa-Brandwag, a right-wing, fascist-like, Afrikaner movement established in 1938 and suppressed by the Smuts government during the Second World War. 107. TNA: DO 35/1008/7, WG 429/13, Clutterbuck to Stephenson, 29 September 1939. 108. NASAP: A1 Smuts Papers, Volume 132, f 66, Memorandum by Maj. Gen. Jack Collyer, c.1939. 109. Cowie, "Union of South Africa", pp 262-263. Dr Andrew Stewart kindly furnished this reference.